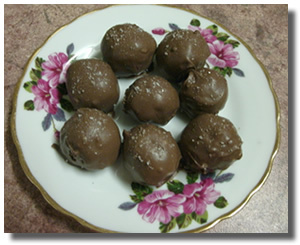 These are no ordinary chocolate peanut butter balls, not that there is a single thing wrong with the "originals." Being from Ohio, I love Buckeye Candy and it's definitely an old family favorite. But this year I came across an idea that first intrigued me, and then nearly made me slap my forehead thinking, "Now why didn't I think of that?" I don't even remember now where I first encountered this particular tasty twist, but once I did, I started looking around and learned that my newest kitchen creation has the adorable nickname of "Chubby Hubbies." I wasn't exactly looking for another chocolate covered pretzel recipe, but when I saw this blend of the traditional chocolate covered pretzel and the traditional chocolate covered peanut butter ball, I knew it was a match made in heaven. 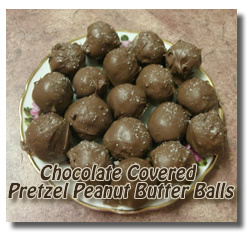 Chocolate Peanut Butter Balls + Pretzels! You probably already know that there is something deliciously addictive about the sweet and salty combination of chocolate and peanut butter. 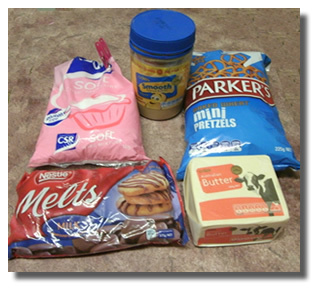 And, of course, the same is true about the blend of sweet chocolate and salty pretzels. But have you ever thought about combining those three awesome flavors in one mouthwatering bite? It's a real winner! 1. 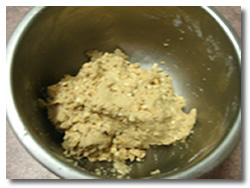 In a large bowl, combine the peanut butter and butter and mix well. 2. Add the crushed pretzels and powdered sugar until you get a nice firm dough. 3. 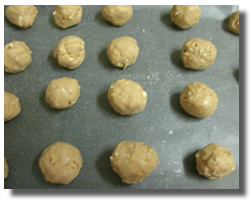 Roll the dough into 1 inch balls and place on a waxed paper lined tray to chill. I'm currently living in the tropics so chilling is a necessity here! :) You may be able to skip this step if you're living in a cool environment when preparing this special chocolate covered pretzel recipe. You can use a double boiler or a bowl setting on top of a pot of simmering water if your prefer. Just be careful not to get any steam or water in your chocolate or it will seize. TIP 1: I add a teaspoon of coconut oil to my chocolate to help it stay smooth and set properly. Paramount Crystals also work well. TIP 2: Remember, this crazy chocolate peanut butter pretzel ball recipe is all about the salt and sweet combo. 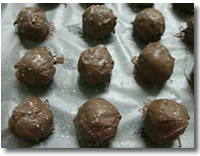 So, while the chocolate is still wet on the dipped chocolate peanut butter balls, I sprinkle some sea salt on the top. Mmmm. It DOES make a difference and it's oh so good! Do you have a favorite Christmas candy recipe? Share it here! We'd love to try it, too.